Sugar & Spice Cranberries are a tart, sweet treat – made with a deliciously spiced simple syrup. The older I get, the more I come to appreciate the simple things, and at no time of the year do I feel this more intensely than during the holiday season. Call me boring (and some of you will!) but one of my favorite things to do this time of year is curl up with my sweetheart in our big, comfy chair and watch “It’s a Wonderful Life.” Not because I love the movie so much – honestly it isn’t my favorite. But it is his favorite. To see the man I fell in love with three decades and more ago still tear up when George Bailey stands on those stairs, the whole town gathered around, and that little bell on the Christmas tree rings – that singular moment is the reason I love it. It is in that moment when Jimmy Stewart, standing there on the stairs holding Juju and her petals, manages across seven decades to communicate to us on a level so deep that the first recognition comes not in cerebral cognizance, but through the base reactions of our own bodies. Our eyes well and our cheeks flush and our hearts grow – and we know to our marrow that life really is wonderful. And then, inevitably, a single heavy tear falls down my sweetheart’s face, and he pulls me close and looks into me with wide-open eyes and wraps my soul in his smile. That. That right there. I would watch “It’s a Wonderful Life” a thousand times from beginning to end for that. Believe me; I didn’t intend to go this direction at all when I started typing, but here I am. And now, here you are reading it. I guess that’s the thing about being your own editor: sometimes you keep the sentences [even the ridiculously long fragments] you love – not because they are particularly good, but simply because you love what they mean to you. And now, back to our regularly scheduled program…. 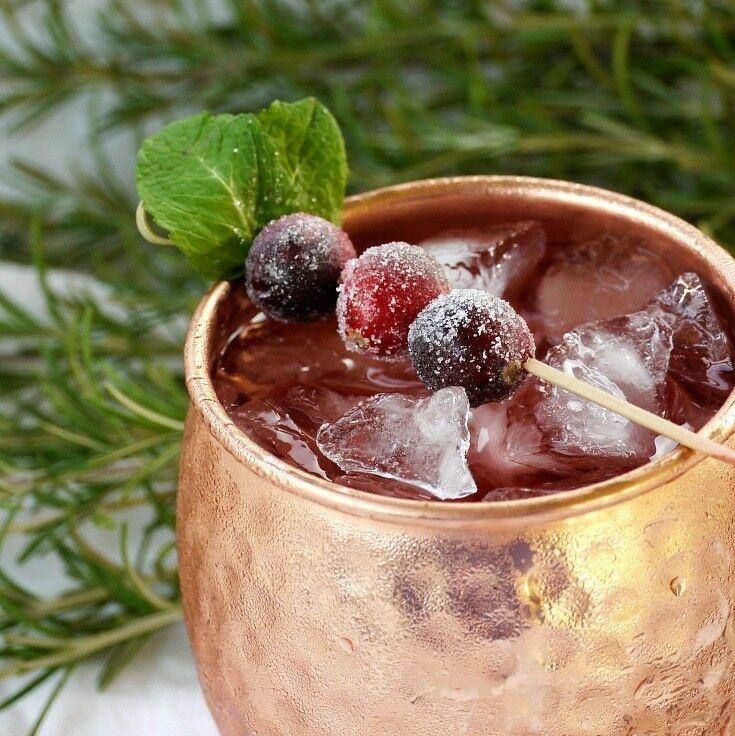 This post grew from the need to make a Spiced Simple Syrup for an amazing Spiced Cranberry Mule that Mr B will be sharing in an upcoming post. 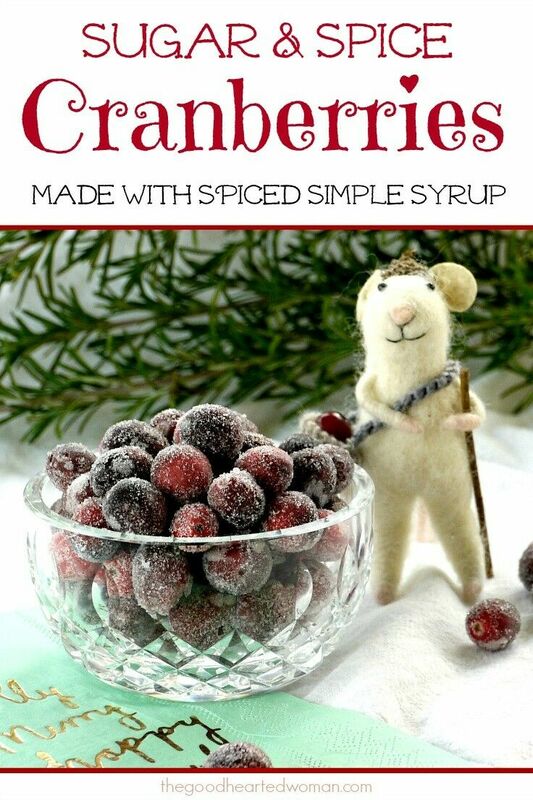 I started thinking about garnishes for his latest concoction and remembered seeing a recipe for Sugared Cranberries that I’d always wanted to try. Then, as usual, I decided to take it a step further, and Voilà! Sugar & Spice Cranberries! Sugar & Spice Cranberries are a tart, sweet treat, made with a deliciously spiced simple syrup; perfect for holiday snacking, creating beautiful garnishes, or decking out everything from salads to desserts. Line a baking pan with a silicone mat, aluminum foil or plastic wrap and set a wire cooling rack on top. 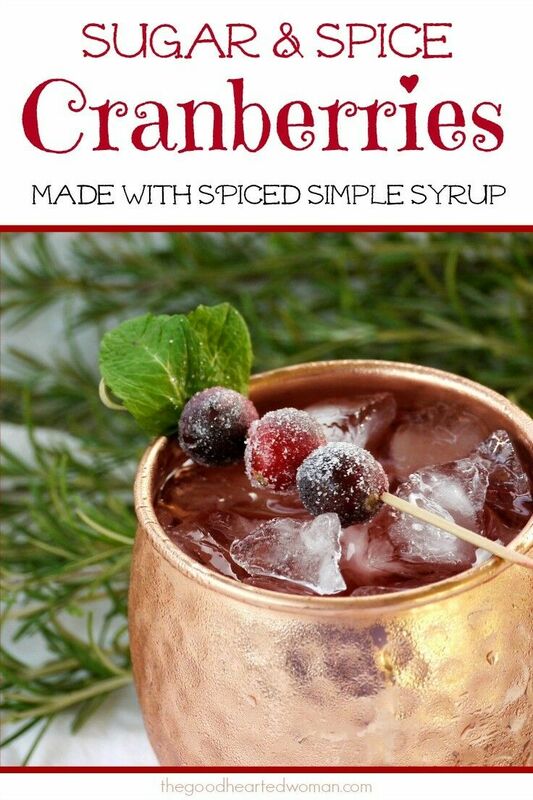 In a small bowl, toss one cup of cranberries in ¼ cup of the spiced simple syrup. Remove with slotted spoon and place on wire rack. Let cranberries set on the wire rack for at least an hour. 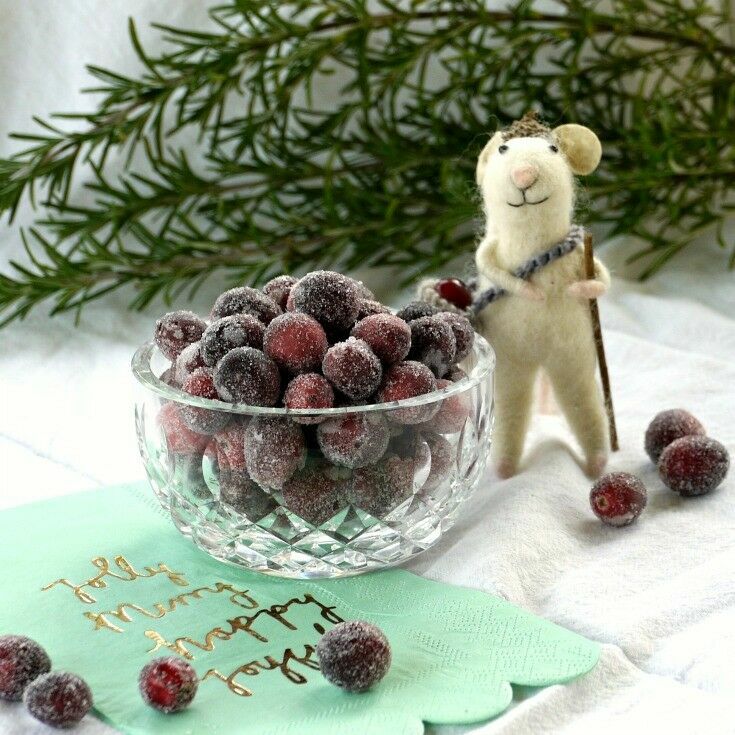 Place the granulated sugar in a medium bowl or Ziploc bag, and toss the sticky cranberries until well coated. Refrigerate prepared cranberries for at least an hour before using. 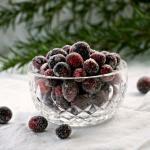 Cranberries can be refrigerated for up to a week. In a small saucepan over medium-high heat, stir together water, sugar, cinnamon sticks, sliced ginger, star anise, and heat, stirring frequently, until the sugar has completely dissolved. Bring mixture to a boil and allow to simmer for 4-5 minutes. Remove from heat and allow mixture to cool completely. 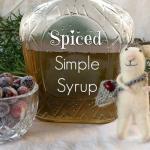 Using a slotted spoon, remove spices from liquid and pour into bottle or jar. Mixture can be refrigerated for at least two weeks. 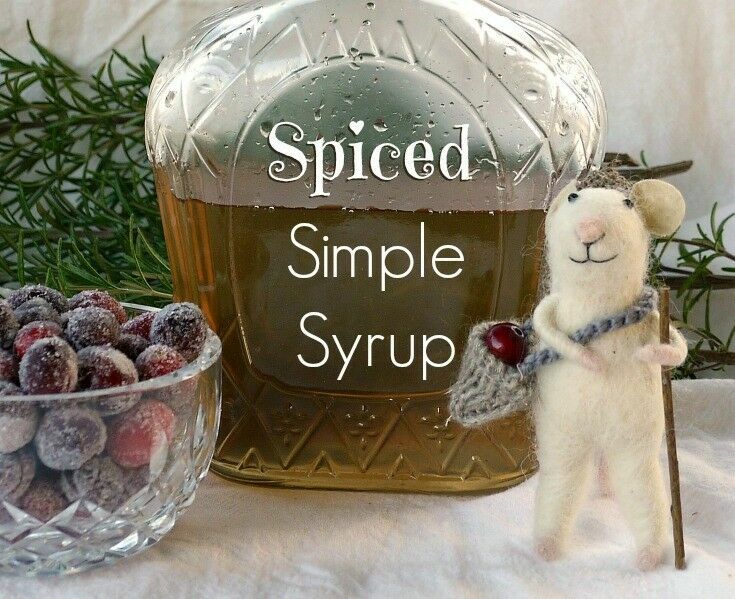 You should probably make a batch this weekend – you may be needing a little Spiced Simple Syrup and some Sugar & Spice Cranberries sooner than you think! Thank for getting it, Marlynn. You’re the best. Christmas movies just seem to bring out the best memories in people – I love them all, just for the fact that they remind me of the past years. 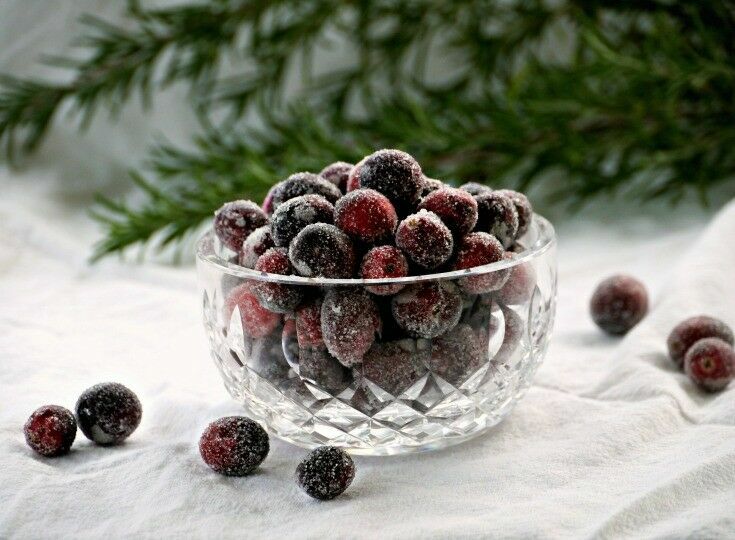 These cranberries look fantastic too – What a great garnish they make! You are the sweetest lovebirds, and I love this story about how little gestures of love can have so much meaning and affirmation and should be remembered to be appreciated! <3 Unfortunately my DH isn't into this holiday season, but he has his own version of this movie – it's just Field of Dreams. Also, I LOVE your mouse model in these photos, I have a huge crush on him! Thanks, Pech! I fell in love with that little mouse too! (Hint: You can find one just like him at New Seasons.) Now I’m working on a DIY… which probably won’t actually happen until next holiday season. We’ll see. We actually have never seen that movie in its entirety… it’s on our list for Christmas this year! We keep saying we should watch it. It’s definitely a sentimental favorite.